Some awards make you happy, others make you genuinely proud. The Microsoft Gold ISV competence belongs in the latter category. For the uninitiated this sound like nothing more than a color and an abbreviation. But in the Microsoft Partner world it is a big deal. What does Gold ISV mean? Microsoft awards so-called competences to its partners by awarding them either Gold or Silver status in different areas. ISV stands for Independent Software Vendor. Independent Software Vendors develop and distribute their own solutions which are based on Microsoft products. proMX specializes in apps for Microsoft Dynamics 365. “Our Dynamics 365 apps are informed not only by years of experience in software development but also by the industry expertise we have accumulated during the course of many customer projects. It is great that Microsoft has now certified this competence,” says proMX CEO Peter Linke. proRM Fast Start, a project and resource management app which is compact and inexpensive enough to work both as an entry-level project management solution and as an alternative to the more comprehensive Dynamics 365 for Project Service Automation app. Back in March, proRM Fast Start had already received Microsoft’s highest possible accreditation. Project management add-ons Time Tracking, Approval Manager and Project Gantt add further project management and controlling features to Dynamics 365 for Project Service Automation. Also part of proMX’s product portfolio are proStorageSaver, which transfers files from Dynamics 365 storage to Azure Blob, proAdvancedSearch, an additional search function for Dynamics 365, and proAutoNumber for automated numbering of records. proMX was one of the first companies to offer its Dynamics 365 solutions on AppSource, Microsoft’s cloud marketplace, and the first Dynamics 365 Partner to provide a free Test Drive experience. 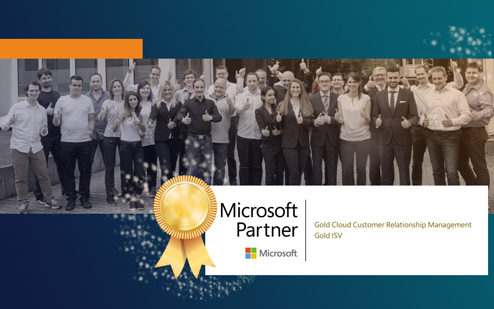 Previously, proMX had also received Gold status for Cloud Customer Relationship Management (for our expertise regarding Dynamics 365 for Sales, Customer Service, Field Service, Project Service Automation and Marketing) as well as Silver status for Enterprise Resource Planning as well as Small and Mid-Market Cloud Solutions (for expertise regarding cloud and hybrid solutions for SMEs). What do these certifications mean for you? Competence awards help you when looking for the right partner for your digitization project. Certified Microsoft Partners are leaders in their respective areas, from whom you will receive top-notch service. Should you be interested in an ISV app, the Gold or Silver logo assures you that it will be a high-quality product. Office 365: 5 common Microsoft Word problems – and how to solve them!